Researchers at DTU and Danish Research Centre for Magnetic Resonance, Hvidovre Hospital, have identified the brain signals that help us to focus on a particular sound, for example speech from a single person. This is the first step towards developing a brain-controlled hearing aid. A hearing aid basically enhances all the sounds in our surroundings. This means, for example, that during a restaurant visit, background noise is increased just as much by a hearing aid as the speech from the person sitting opposite. People with normal hearing can easily distinguish and concentrate on listening to what the person is saying. On the other hand, it’s difficult for a person with a hearing aid, for whom all the sounds are equally amplified. 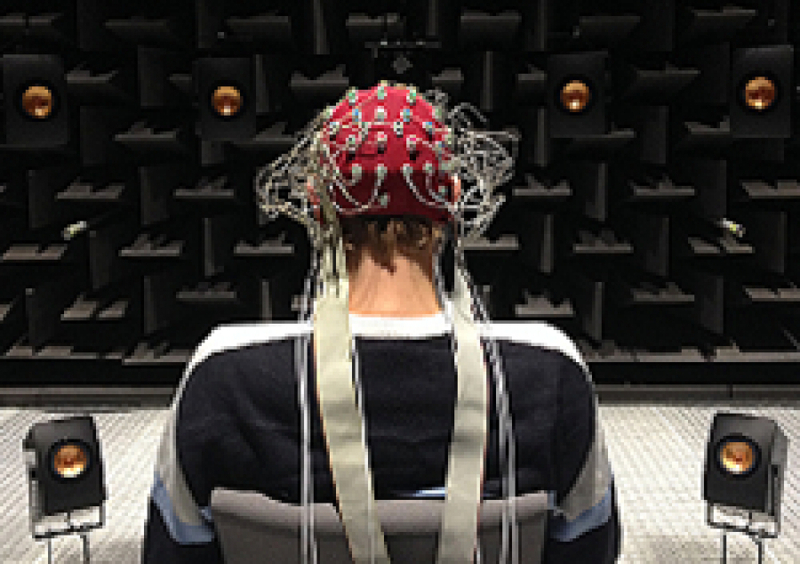 Using electroencephalography (EEG) measurements with electrodes on the head, researchers at DTU Electrical Engineering have managed to decode the processes in the brain that enable us to differentiate sound and concentrate on, for example, what one particular person is saying. The measurements have paved the way for researchers to then develop models and algorithms for the process which in future can be used to send the exact sound to the hearing aid that the user wants to hear. The work has been carried out as part of the European COCOHA project (Cognitive Control of a Hearing Aid), in which DTU is participating together with French, English and Swiss universities as well as the hearing aid manufacturer Oticon’s Eriksholm Research Centre. “The goal of the COCOHA project is to help hearing aid users enhance the sound that they’re focusing on. In other words, cognitive control of the hearing aid, where the listener’s attention controls which signal should be amplified. We’re working with using brain signals to control hearing aids, and after the first few years of research, we’ve managed to show that it is actually possible to achieve such real-time control,” says Jens Hjortkjær, Senior Scientist at DTU Electrical Engineering and Hvidovre Hospital. The Danish researchers have conducted tests where electrodes on the head of a test person have measured the brain’s activity when the person was asked to concentrate on listening to the voice from person A while ignoring that from person B. The activity in the brain was then used to amplify the sound of person A’s voice and mute the sound from person B and send this to the hearing aid. Being able to hear the sound you want to listen to has been made possible by using the models and algorithms developed in the course of the researchers work to decode the brain processes.